Last Saturday My Yanni and I hosted a tailgate at home to cheer on the Buckeyes on as played (and beat) Illinois. It was a splendid sunny day despite the crazy winds and we all had a ball eating, cheering & chatting and eating some more. I mean what’s game day without delicious food after all? I spent the morning setting the scene with some festive and easy DIY decorations while My Yanni also known as My Grillmaster, got busy preparing the food for the grill. I don’t know about you, but when it comes to tailgating, whether I’m at home or at the stadium, I like great food without the fuss. So that’s exactly what we did, made great food that came together in no time flat. 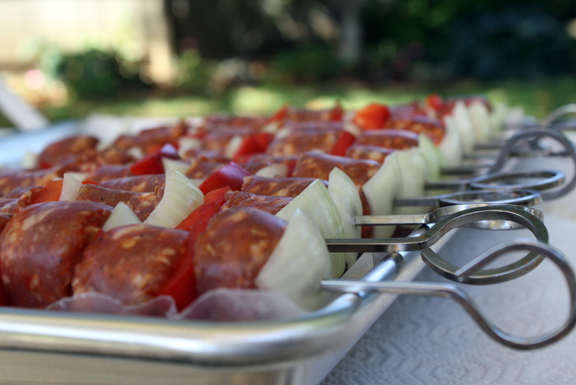 We served Spicy Brat-Kabobs that were as simple to put together as they were delish. All you need are spicy Brats, red peppers and onion. We decided to use red & white to keep the theme of the buckeye colors but you could use any peppers or veggies that you fancy. My Grillmaster used one brat per kabob, cut into five pieces and alternated a piece of brat-pepper-onion-brat, for a yummy and eye pleasing ratio of veggies and meat. What can I say, he’s an a Renaissance man. That’s why I love him so much. And that’s it for the prep. Now that’s what I call no fuss. Once your brat-kabobs are assembled it’s time for the grilling. Grill the kabobs for about 30 minutes, turning occasionally, until cooked through. While the kabobs were grilling, I got busy preparing the side. 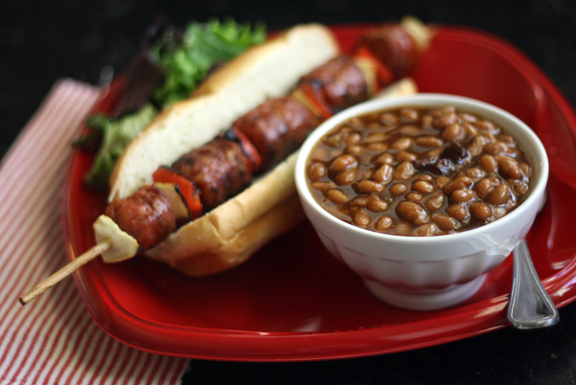 We served Bush’s Country Style Baked Beans. The Bush’s® Country Style baked beans are slow-cooked with extra brown sugar, in true country fashion, and infused with the robust taste of hickory smoked bacon. Which meant that all I had to do was open the can and heat the beans. I’d say that keeps with my theme of great food and no fuss, wouldn’t you? Just look at that gorgeous piece of hickory smoked bacon. Um…yum. 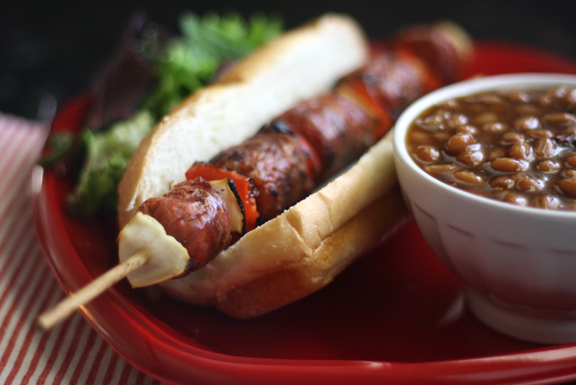 The Country Style paired perfectly with the spicy brat-kabobs. It’s a game day dream. Stress-free & delicious. This is my kind of tailgating. Which left plenty of time for what’s really important….enjoying good company and…oh yeah, watching some football too! Thanks so much for stopping by! Hope you’ll come back for the succulent Greek Fetish Burgers and a fun giveaway from Bush’s Beans! 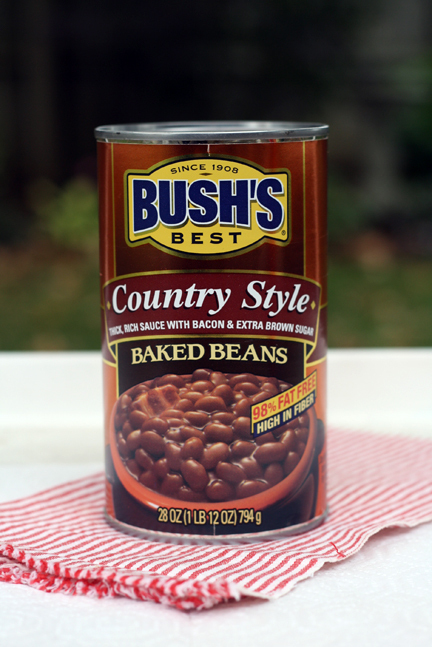 Disclamer: The tailgate and giveaway are in partnership with Bush’s Beans. However my opinions, thoughts and photos are 100% my own. Cut each bratwurst into 4-5 pieces. 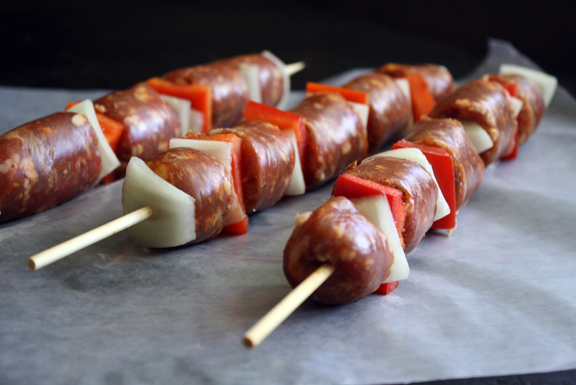 Clean red peppers and onion, cut into square pieces the same diameter as the brats to ensure that they will cook evenly. You’ll use one bratwurst per skewer. Start with the end piece and assemble end-to-end placing a piece of onion and pepper between each until you’ve used all of the pieces. Place kabobs over medium-high heat and cook, turning occasionally, for 30 minutes or until brats are cooked through. loos so fun and delis! I love this. OMG. I really do. Chunking (?) up the sausage like that for a kebab, are you kidding? DONE. My life is beautiful once again. Our weekend dinner for sure! and kebabs. Please invite me again. Delish! I’m totally coming to your house to tailgate. Love this fun idea for tailgating! SO easy and fun..and could you be any cuter?! Ok…you are your friends are too, too gorgeous!!! And, um, yes please on those kabobs! You are too cute Bridget! Thank you! 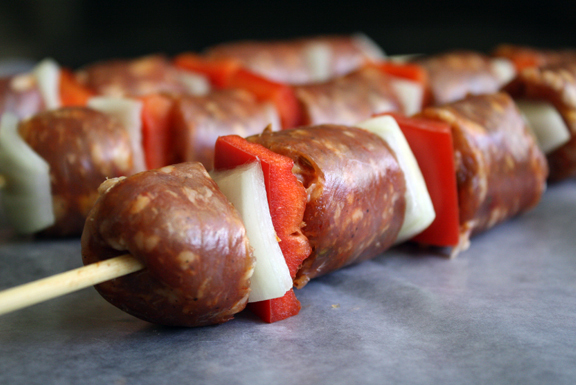 I’m in love with how you made these sausages into kabobs. I’m really into sausages these days but it never occurred to me to… “kabob” them 🙂 Yet another fun inspiration from you! Brat Kabobs! What a great idea! The only reason I don’t enjoy brats more is that the are huge! I love the idea of bite-size pieces. Creative recipe! This is pretty genius – and absolutely perfect for tailgating!